Starting tonight, Philadelphia neighborhoods will light up for the 2014 holidays with festive celebrations, parties, parades and tree lightings by South Street Headhouse District, East Passyunk Business Improvement District, Go Mt. Airy, Glen Foerd on the Delaware and Christmas Village. All events listed below are free (unless otherwise noted) and open to the public. Make sure to bring your family to one or all of them. Don't forget to bring an unwrapped toy to the events on South Street and East Passyunk as part of the Joy of Sharing Campaign by CBS Philly. Head to Philadelphia City Hall for the Holiday Celebration and Tree Lighting Spectacular with a 35-foot-tall Norway spruce from Linvilla Orchards. Entertainment starts at 6:00pm, with the ceremony at 7:00pm. Tonight is also the first night the Christmas Village Christmas Tree in LOVE Park will be lit. Stop by after today for photos with the twinkling tree and the iconic LOVE Statue. 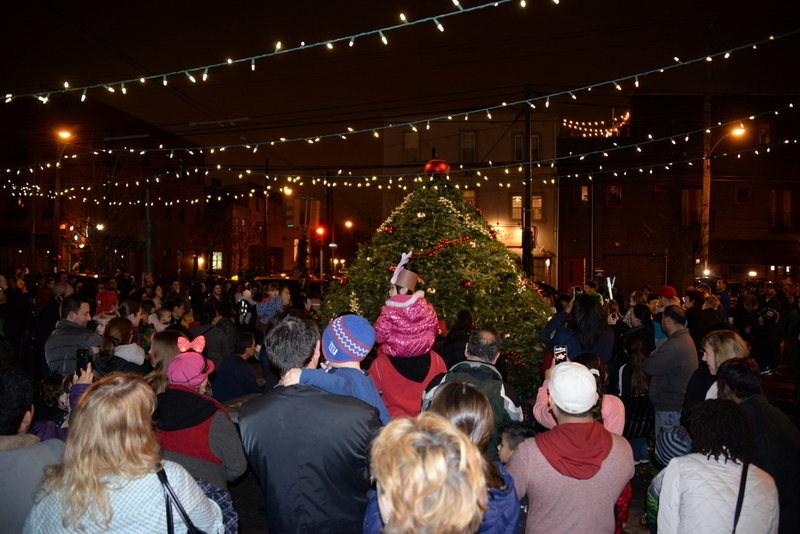 Kick off the holidays with the annual Tree Lighting Party at the Singing Fountain (Tasker Street and East Passyunk Avenue) from 5:00pm to 7:00pm. The free celebration will include live music, carolers, holiday sweets, shopping and other surprises. Don’t forget to bring an unwrapped gift for a toy drive to benefit local youth. After the party, stay until 9:00pm for extended shopping hours as the Deck the Ave campaign kicks off with shopping, sales and other festivities during December. Mt. Airy rings in the Holiday Season with events all weekend, kicked off by a tree lighting at the Lutheran Seminary at 4:45pm, with music from the Salvation Army Brass Band, followed by a community run Caroling session down the Avenue. That same evening, take pictures with Santa at Rothe Florists from 6:00pm to 8:00pm. The event is free and includes warm cider, cookies and candy canes for all. There will be a store-wide sale on all holiday trimmings. Glen Foerd will partner with Settlement Music School’s Kardon Northeast Branch to bring musical and ballet performances to the family friendly event Christmas at the Mansion. From 1:00pm to 6:00pm the public is invited to experience the mansion in full holiday décor, enjoy performances and children’s crafts. The Dining Car will be selling holiday sweets and cookies. Join Santa at 5:00pm as he makes an appearance at our outdoor holiday tree lighting and joins guests in singing holiday carols, followed by the tree lighting ceremony at 5:30pm. South Street Headhouse District presents their annual extravaganza Winter Wonderland from 3:00pm to 7:00pm, at the Historic Headhouse Square Shambles on 200 Pine Street, Philadelphia, PA 19147. Free family fun will include the annual holiday tree lighting, Santa Claus arriving on a firetruck, free horse-drawn carriage rides, performances by Philadelphia Dance Academy and Society Hill Dance Academy, and the Headhouse Holiday Market in conjunction with PHAIR. Brauhaus Schmitz will serve mulled wine and other treats. Before or after the festivities, stroll the district and check out holiday displays at 30+ businesses competing in the Window Wonderland Storefront Challenge. The Christmas fun continues after the trees are lit! Help us light up the city with the Lantern Parade at Christmas Village in Philadelphia: Presented by NRG Home. This German-style Lantern Parade starts at 5:00pm. Bring your homemade lantern and meet at the iconic LOVE Statue. The Snow Queen, along with Gerda and Kai fromEnchantment Theatre Company’s The Snow Queen, will lead the parade of lights around LOVE Park and Center City. The parade will end at the Christmas Village stage with a sing-a-long led by children from East Passyunk’s Alphabet Academy Daycare and a free concert by the The Philly POPS Festival Brass. Join the parade with your family, or simply come to watch! All lanterns should contain battery-operated candles or lights, no flames.